During your slow business periods, you can use Promotions to attract new and existing clients to generate more business. In this example, we will set up your own Groupon-Style promotion. It is a Multi-Code promotion whereby you can set the number of discounts available your clients can use to receive the promotion. This can be done via Online booking or in the Sales screen during the payment process. In the Details for new Promotion screen, simply follow the steps illustrated below. You must enter a Promotion Title, Start Date, Discount Type and Discount Amount. Make sure to also enter an End Date for the promotion. In the Discounts Available field, enter the number of times the promotion can be used. 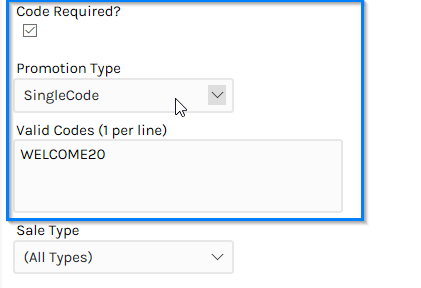 To enable the multi-code promotion tick the Code Required? checkbox, select MultiCode in the Promotion Type field. Enter the code in the Valid Codes field separated by a carriage return (Enter key).